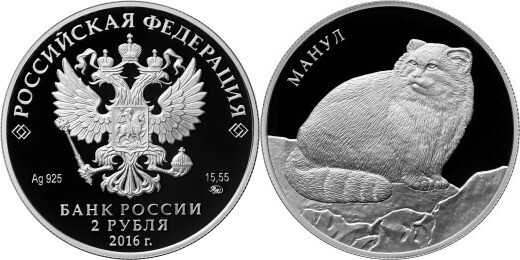 MACEDOINE 100 Denars 2016 – Icône de Vladimir – 31,1 g Argent 925 Proof (partiellement plaqué or) – 7000 exemplaires – taille 30 x 45 mm – prix 62 euros. 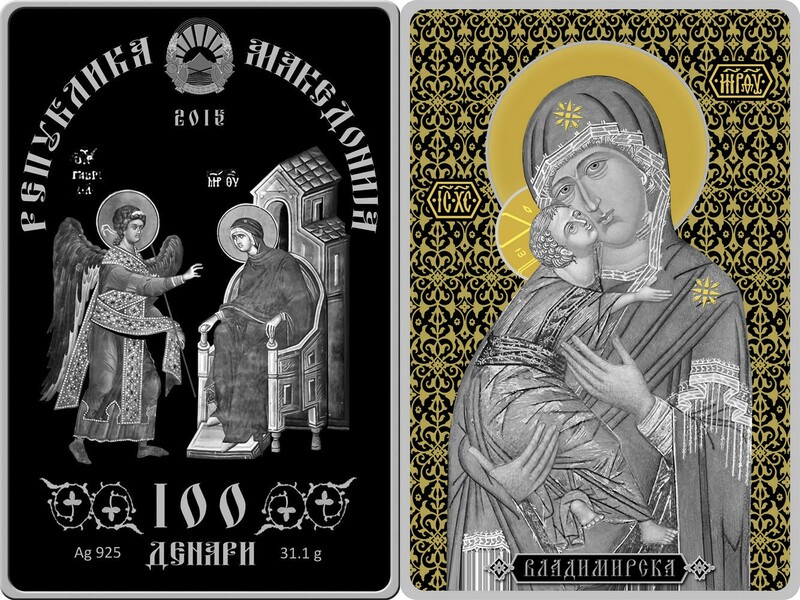 MACEDONIA 100 Denars 2016 – Icon of Vladimir – 31.1 g 0.925 silver Proof (partially gold plated) – mintage 7,000 – size 30 x 45 mm – price $69. 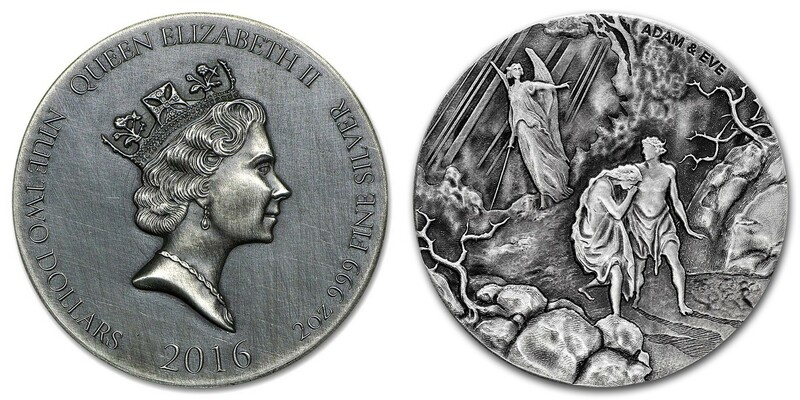 NIUE 150 Dollars 2016 – Shéhérazade – 1 kg Argent 999 BU (haut relief et émaillée) – 300 exemplaires seulement – diamètre 100 mm – prix observé 1900 euros. 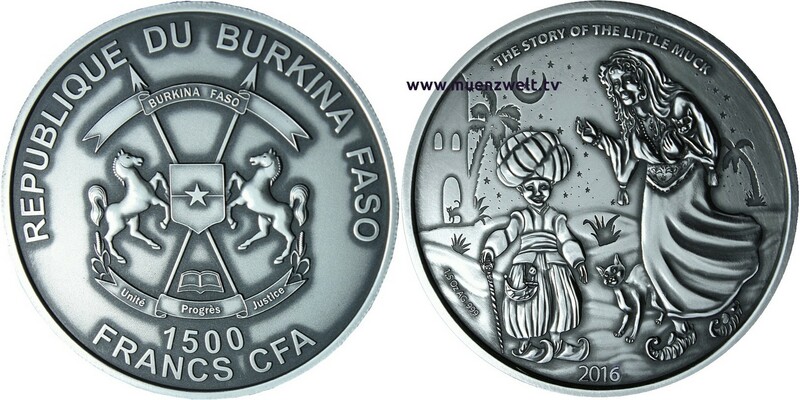 NIUE 150 Dollars 2016 – Sheherazade – 1 kg 0.999 silver BU (high relief with enamel) – mintage 300 pcs only – diameter 100 mm- observed price $2,134. 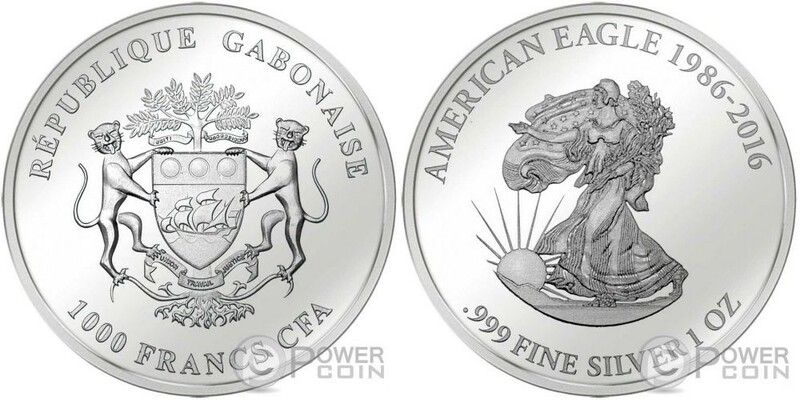 GABON 1000 Francs CFA 2016 – 30 ans de l’Eagle américain – 31,1 g Argent 999 Proof – 999 exemplaires – diamètre 20 mm – prix observé 189,95 euros. Images Power Coin. 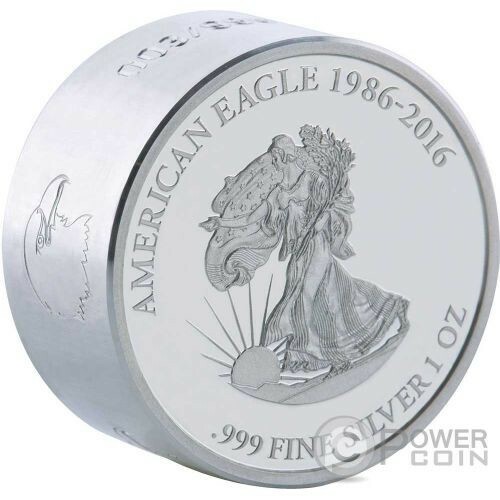 GABON 1000 Francs CFA 2016 – 30 years of the American Eagle – 1 oz 0.999 silver Proof – mintage 999 pcs – diameter 20 mm – observed price $216. Pictures Power Coin. 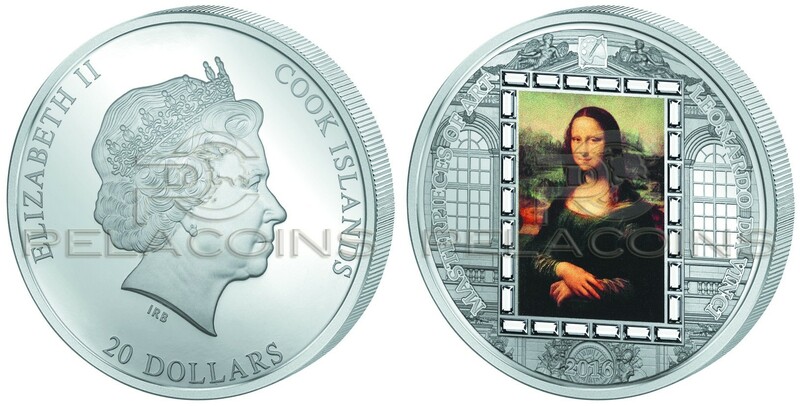 ILES COOK 20 Dollars 2016 – Mona Lisa – 93,3 g Argent 999 Proof (avec 26 cristaux Swarovski) – 1506 exemplaires – diamètre 55 mm – prix environ 250 euros. COOK ISL 20 Dollars 2016 – Mona Lisa – 3 oz 0.999 silver Proof (with 26 Swarovski crystals – mintage 1,506 – diameter 55 mm – approx. price $280. 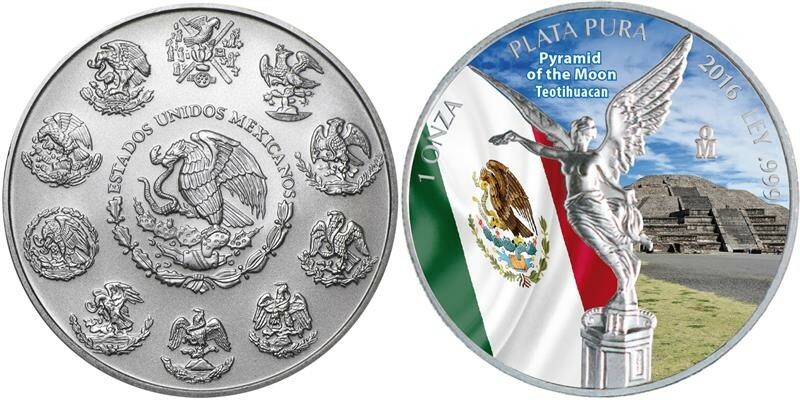 MEXIQUE 2 x 1 Onza 2016 – Libertad – Pyramides Teotihuacan et Uxmal – 2 x 31,1 g Argent 999 UNC – 2500 exemplaires – diamètre 40 mm – prix observé 30 euros. 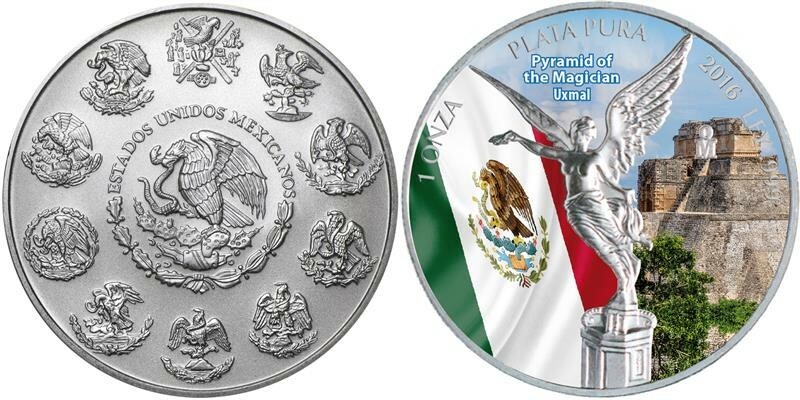 MEXICO 2 x 1 Onza 2016 – Libertad – Teotihuacan & Uxmal Pyramides – 2 x 1 oz 0.999 silver UNC – mintage 2,500 – diameter 40 mm – observed price $34. NIUE 5 Dollars 2016 – Mythes Grecs – Oedipe et Sphinx – 62,2 g Argent 999 Proof (plaqué Rodhium et Or) – 299 exemplaires seulement – diamètre 50 mm – prix observé 320 euros. Images Power Coin. 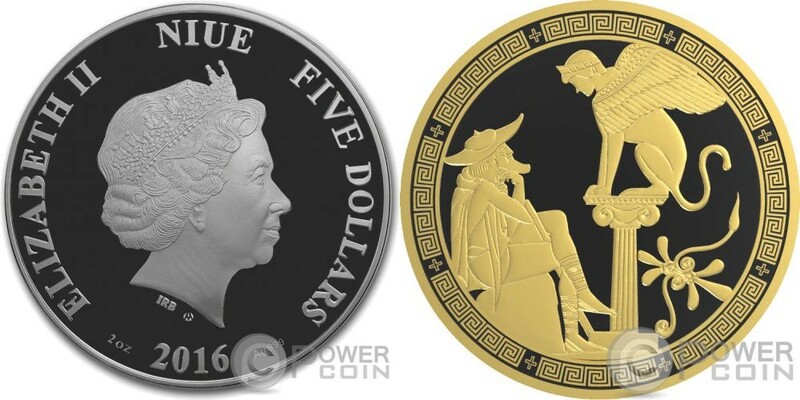 NIUE 5 Dollars 2016 – Greek Myths – Oedipus & Sphinx – 62.2 g 0.999 silver Proof (Rhodium and Gold plated) – mintage 299 pcs only – diameter 50 mm – observed price $361. Pictures Power Coin. 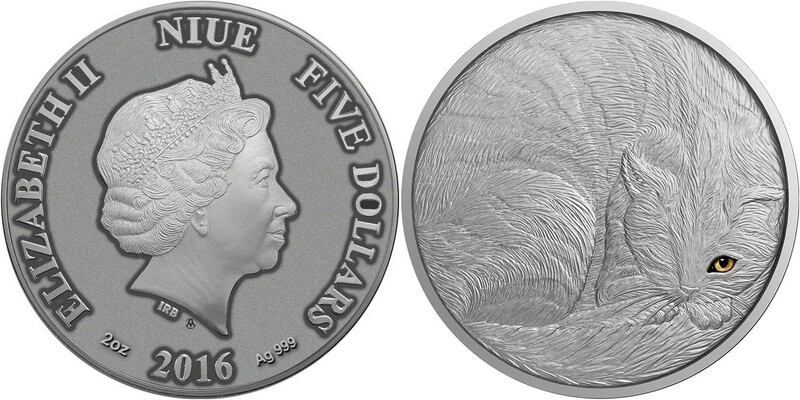 NIUE 5 Dollars 2016 – Œil de chat – 62,2 g Argent 999 Proof – 500 exemplaires seulement – diamètre 50 mm – prix observé 320 euros. 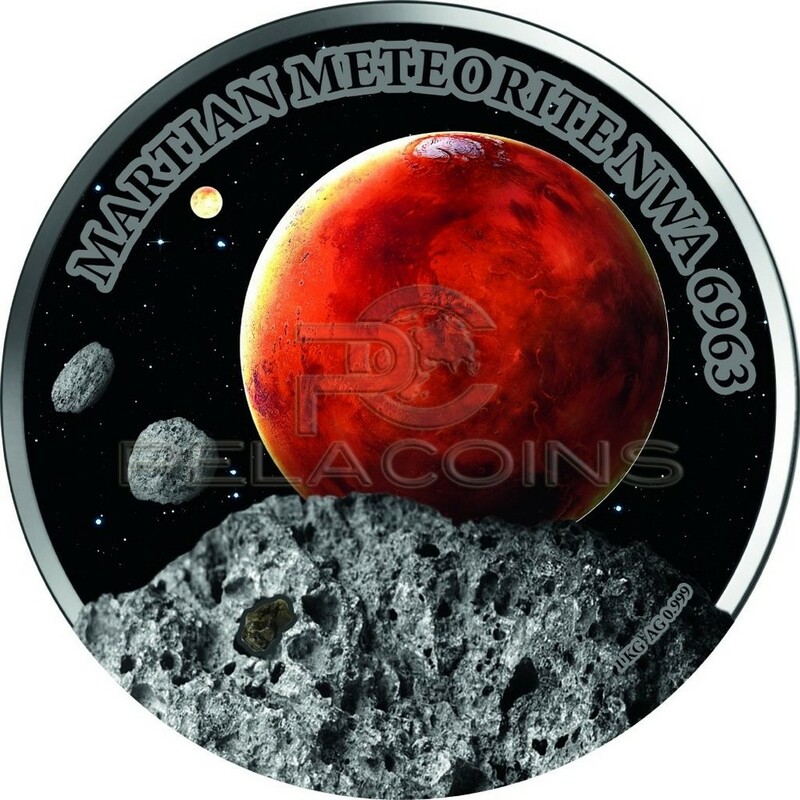 NIUE 5 Dollars 2016 – Cat’s eye – 62.2 g 0.999 silver Proof – mintage 500 pcs only – diameter 50 mm – observed price $361. FIDJI 10 Dollars 2016 – Championnat d’Europe de foot en France – 1 kg Argent 999 BU – 500 exemplaires seulement – diamètre 100 mm – prix observé 1600 euros. Images Power Coin. FIJI 10 Dollars 2016 – UEFA Euro championship of Football in France – 1 kg 0.999 silver BU – mintage 500 pcs only – diameter 100 mm – observed price $1,805. Pictures Power Coin. 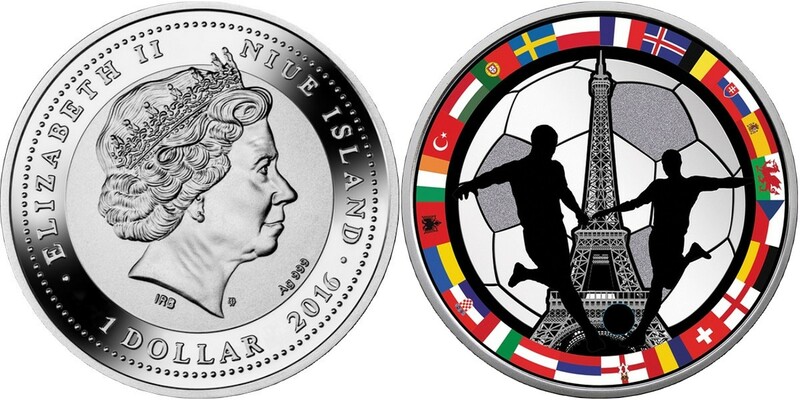 NIUE 1 Dollar 2016 – Championnat d’Europe de foot en France – 17,5 g Argent 999 Proof – 500 exemplaires seulement – diamètre 38,61 mm – prix observé 67 euros. 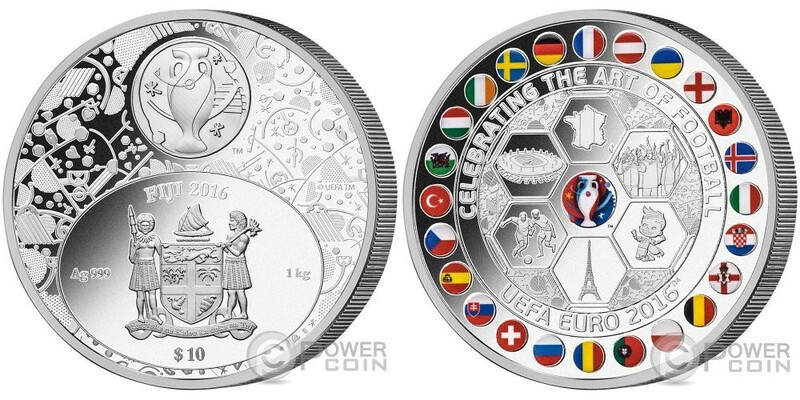 NIUE 1 Dollar 2016 – UEFA Euro championship of Football in France – 17.5 g 0.999 silver Proof – mintage 500 pcs only – diameter 38.61 mm – observed price $76. ANGLETERRE 1 Pound 2016 – La dernière Livre ronde – 9,50 g Argent 925 Proof – 7500 exemplaires – diamètre 22,5 mm – prix 64 euros. Existe en piedfort de 19 g et 3000 exemplaires. GREAT BRITAIN 1 Pound 2016- The Last Round Pound – 9.5 g 0.925 silver Proof – mintage 7,500 – diameter 22.5 mm – price $73. 19 g Piedfort with mintage 3,000 exist. 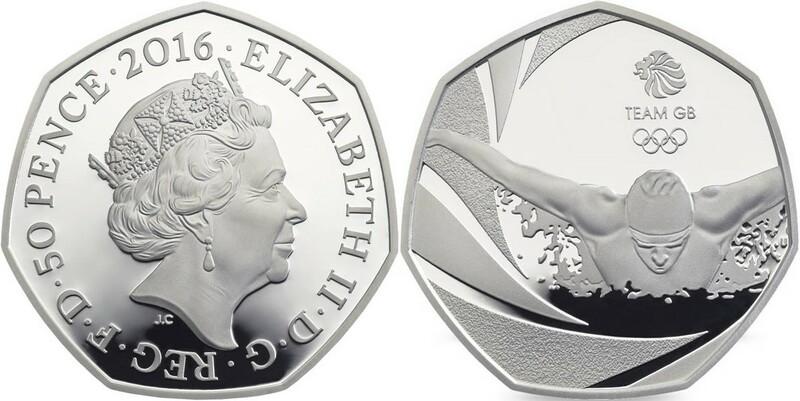 ANGLETERRE 50 Pence 2016 – Equipe olympique anglaise – 8 g Argent 925 Proof – 4000 exemplaires – diamètre 27,3 mm – prix 64 euros. Existe en piedfort de 16 g et 2016 exemplaires. GREAT BRITAIN 1 Pound 2016- Great Britain Olympic Team – 8 g 0.925 silver Proof – mintage 4,000 – diameter 27.3 mm – price $73. 16 g Piedfort with mintage 2,016 exist. 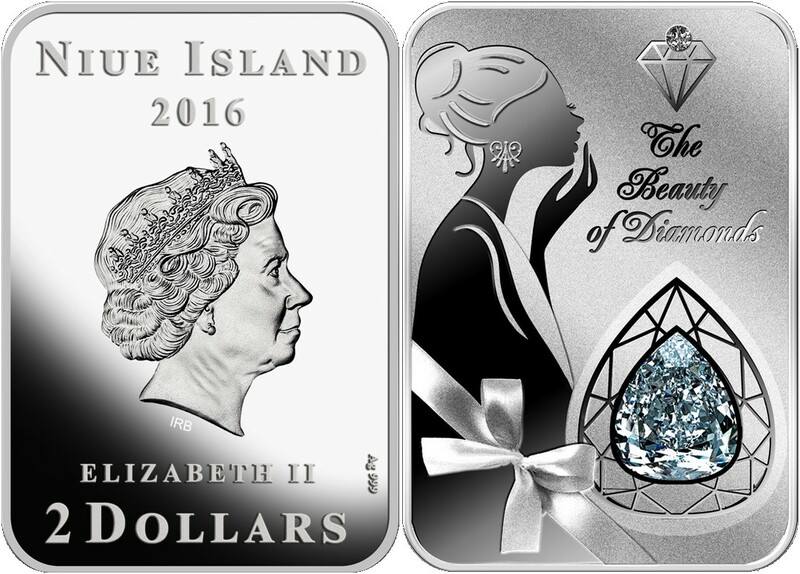 NIUE 1 Dollar 2016 – Ange de vie – 14,14 g Argent 999 Proof (avec insert plaqué or) – 1500 exemplaires – diamètre 32 mm – prix ignoré. 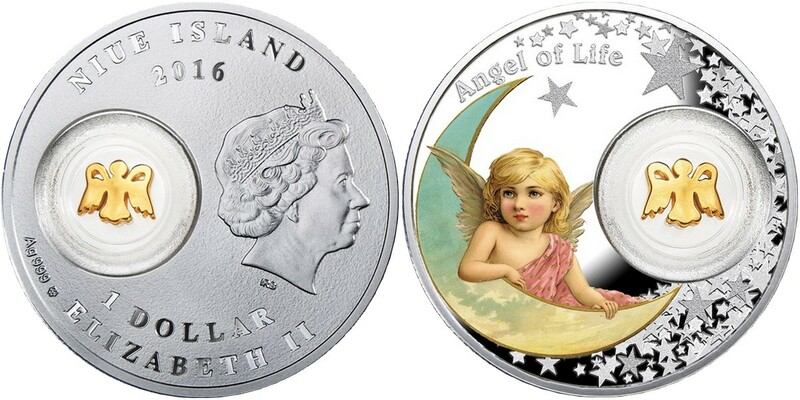 NIUE 1 Dollar 2016 – Angel of Life – 14.14 g 0.999 silver Proof (with gilded insert) – mintage 1,500 – diameter 32 mm – unknown price. NIUE 2 Dollars 2016 – Millenium Star – 31,1 g Argent 999 Proof (avec diamant inséré) – 1000 exemplaires – taille 40 x 28 mm – prix ignoré. NIUE 2 Dollars 2016 – Millenium Star – 1 oz 0.999 silver Proof (with diamond insert) – mintage 1,000 – size 40 x 28 mm – unknown price. NIUE 1 Dollar 2016 – Arbre de chance – 31,1 g Argent 999 Proof (avec de l’ambre) – 1000 exemplaires – diamètre 50 mm – prix ignoré. 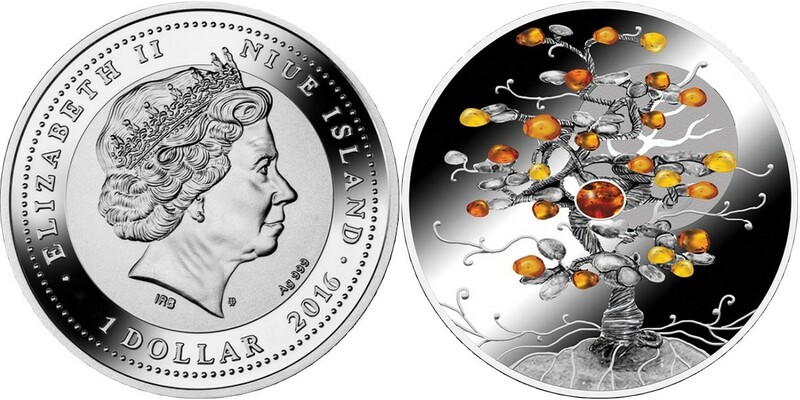 NIUE 1 Dollar 2016 – Tree of Luck – 1 oz 0.999 silver Proof (with amber) – mintage 1,000 – diameter 50 mm – unknown price. NIUE 2 Dollars 2016 – Reine Emnilda – 62,2 g Argent 999 Proof (haut-relief) – 499 exemplaires seulement – diamètre 45 mm – prix ignoré. 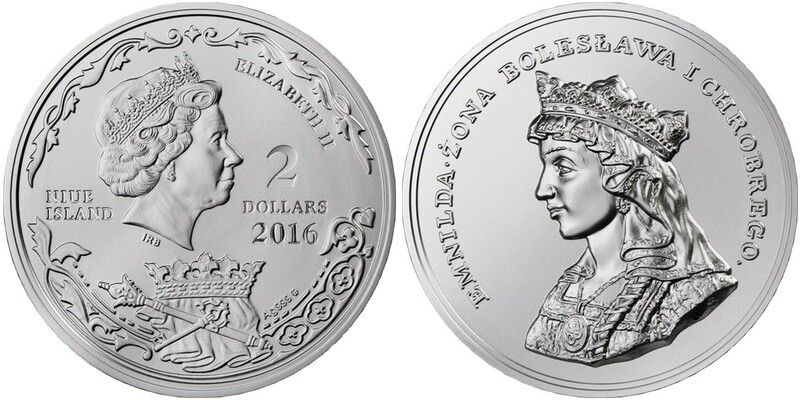 NIUE 2 Dollars 2016 – Queen Emnilda – 2 oz 0.999 silver Proof (high relief) – mintage 499 pcs only – diameter 45 mm – unknown price. NIUE 2 x 1 Dollar 2016 – Hérisson et renard – 10 g Argent 999 Proof – 499 exemplaires seulement- diamètre 32 mm – prix ignoré. 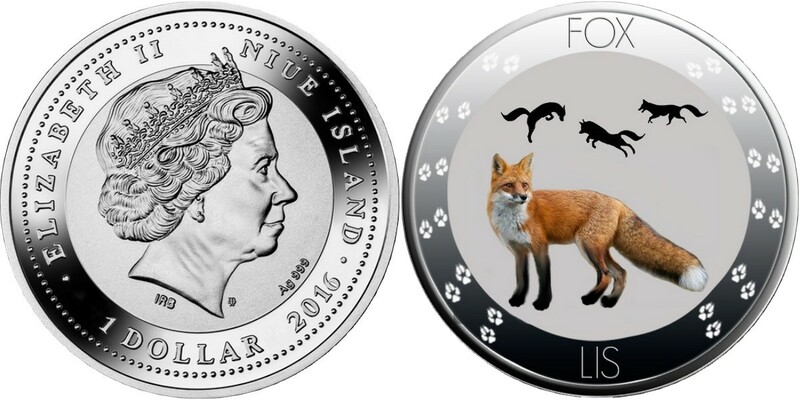 NIUE 2 x 1 Dollar 2016 – Hedgehog & Fox – 10 g 0.999 silver Proof – mintage 499 pcs only – diameter 32 mm – unknown price. CAMEROUN 2500 Francs CFA 2016 – Poker – Valet de Trèfle – 17,5 g Argent 999 Proof – 599 exemplaires – taille 30 x 47 mm – prix ignoré. 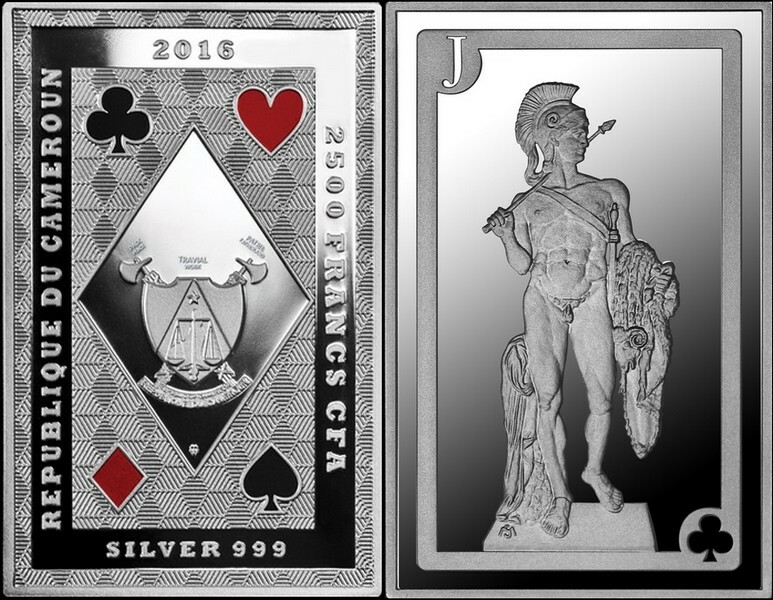 CAMEROON 2500 Francs CFA 2016 – Poker – Jack of Clubs – 17.5 g 0.999 silver Proof – mintage 599 pcs – size 30 x 47 mm – unknown price. ILES COOK 2 x 10 Dollars 2016 – Dieux Nordiques – Freyr & Sif – 2 x 62,2 g Argent 999 finition antique (haut-relief) – 999 exemplaires – diamètre 38,61 mm – prix environ 100 euros chaque. Images Power Coin. 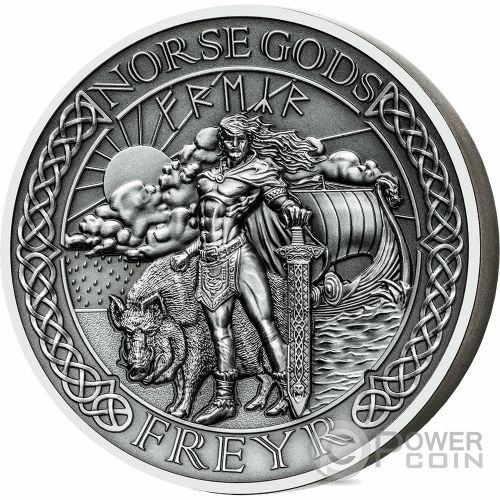 COOK ISL 2 x 10 Dollars 2016 – Nordic Gods – Freyr & Sif – 2 x 2 oz 0.999 silver antique finish (high relief) – mintage 999 pcs – diameter 38.61 mm – approx. price $113 each. Pictures Power Coin. 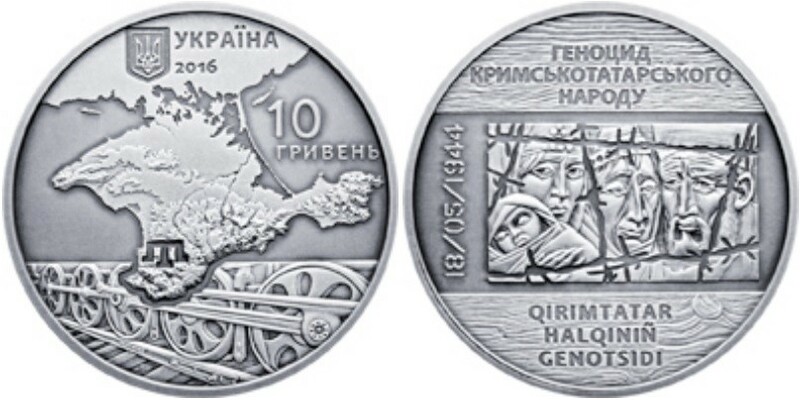 UKRAINE 10 Hryvnia 2016 – Peinture Petrikivsky – 33,74 g Argent 925 Proof – 5000 exemplaires – diamètre 38,6 mm – prix ignoré. 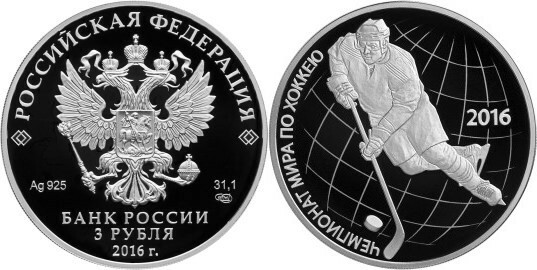 UKRAINE 10 Hryvnia 2016 – Petrikivsky Painting – 33.74 g 0.925 silver Proof – mintage 5,000 – diameter 38.6 mm – unknown price. 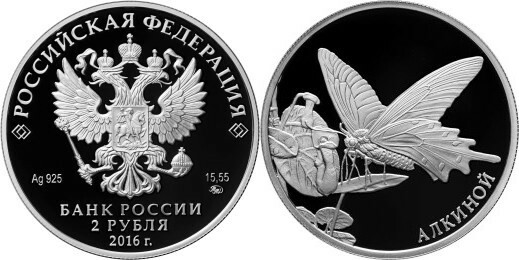 BELARUS 20 Roubles 2016 – Voie Skaryna – Cracovie – 33,62 g Argent 925 finition antique – 2000 exemplaires – diamètre 50 mm – prix environ 50 euros. 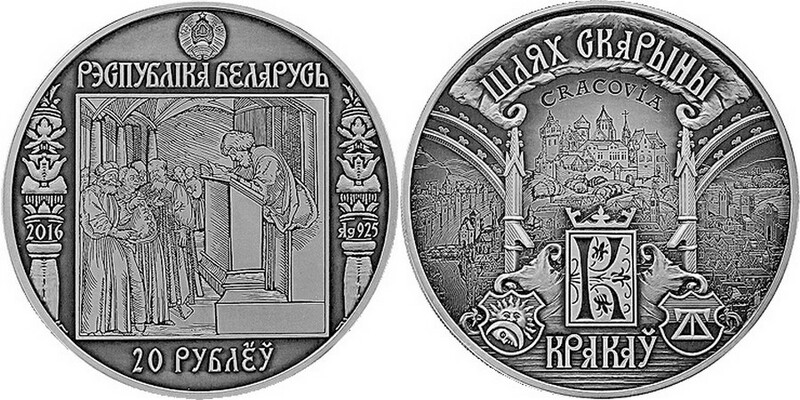 BELARUS 20 Rubles 2016 – Skaryna’s way – Cracovia – 33.62 g 0.925 silver antique finish – mintage 2,000 – diameter 50 mm – approx. price $56. CONGO 10000 Francs CFA 2016 – Angkor Wat – 1 kg Argent 999 finition antique (avec insert de malachite) – 100 exemplaires seulement – diamètre 100 mm – prix observé 3291 euros !! Images First Coin Company. 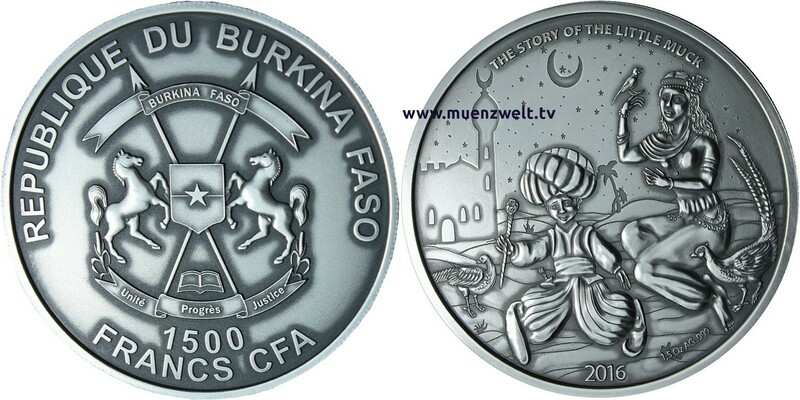 CONGO 10000 Francs CFA 2016- Angkor Wat – 1 kg 0.999 silver antique finish (with malachite insert) – mintage 100 pcs only – diameter 100 mm – observed price $3,799 !! Pictures First Coin Company. CANADA 5 Cents 2016 – Grosses pièces – 5 cents – 157,6 g Argent 999 Proof – 1500 exemplaires – diamètre 65,25 mm – prix 358 euros. CANADA 5 Cents 2016 – Big Coins – 5 Cents – 157.6 g 0.999 silver Proof – mintage 1,500 – diameter 65.25 mm – price $413. CANADA 20 Dollars 2016 – Art et géométrie – Castor – 31,83 g Argent 999 Proof – 7500 exemplaires – diamètre 40 mm – prix 69 euros. 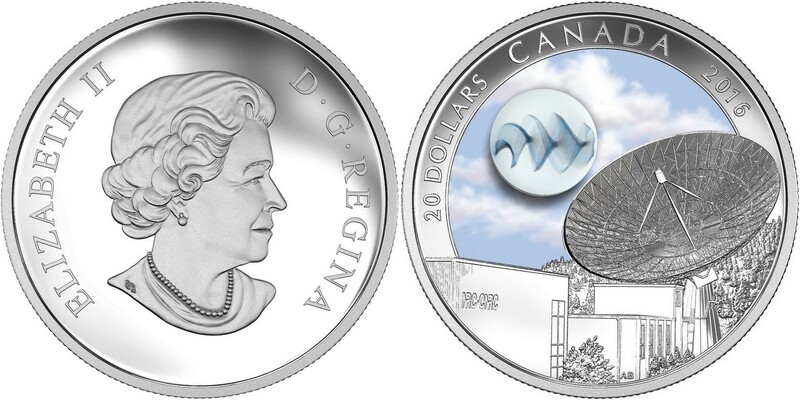 CANADA 20 Dollars 2016 – Geometry & Art – Beaver – 31.83 g 0.999 silver Proof – mintage 7,500 – diameter 40 mm – price $79. 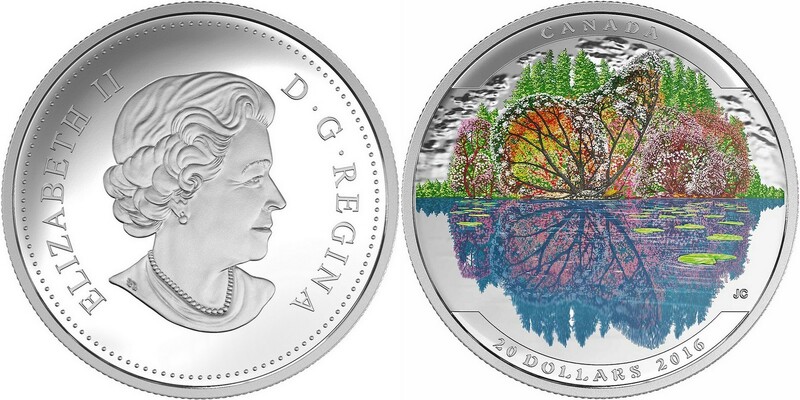 CANADA 20 Dollars 2016 – Paysages et illusions – Papillon – 31,39 g Argent 999 Proof – 5500 exemplaires – diamètre 38 mm – prix 69 euros. 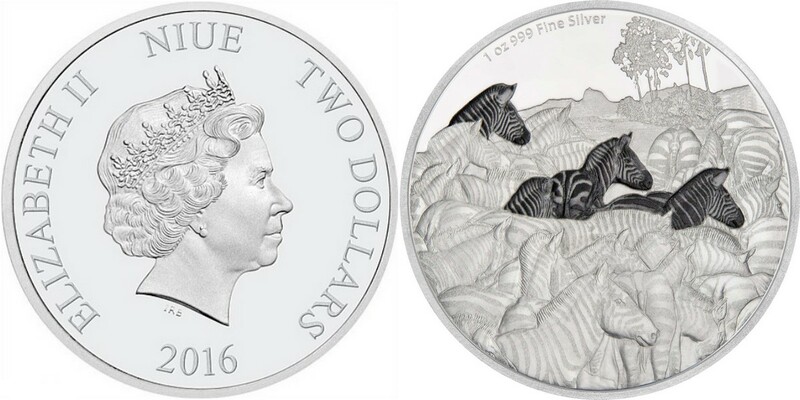 CANADA 20 Dollars 2016 – Landscapes & Illusions – Butterfly – 31.39 g 0.999 silver Proof – mintage 5,500 – diameter 38 mm – price $79. CANADA 10 Dollars 2016 – Batman – 15,87 g Argent 999 fini mat – 15 000 exemplaires – diamètre 34 mm – prix 34 euros. 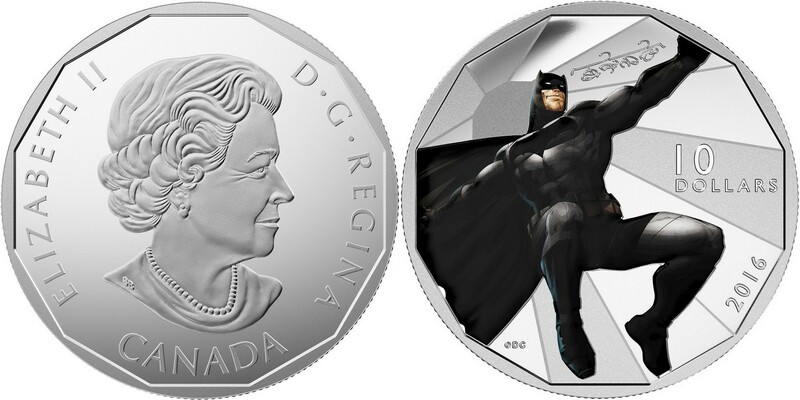 CANADA 10 Dollars 2016 – Batman – 15.87 g 0.999 silver Matte Proof – mintage 15,000 – diameter 34 mm – price $40. CANADA 20 Dollars 2016 – Lynx canadien – 31,39 g Argent 999 Proof – 6500 exemplaires – diamètre 38 mm – prix 69 euros. CANADA 20 Dollars 2016 – Canadian Lynx – 31.39 g 0.999 silver Proof – mintage 6,500 – diameter 38 mm – price $79. CANADA 5 Dollars 2016 – Pierre de naissance – Juin – 7,96 g Argent 999 Proof (avec un cristal Swarovski) – 3000 exemplaires – diamètre 27 mm – prix 34 euros. 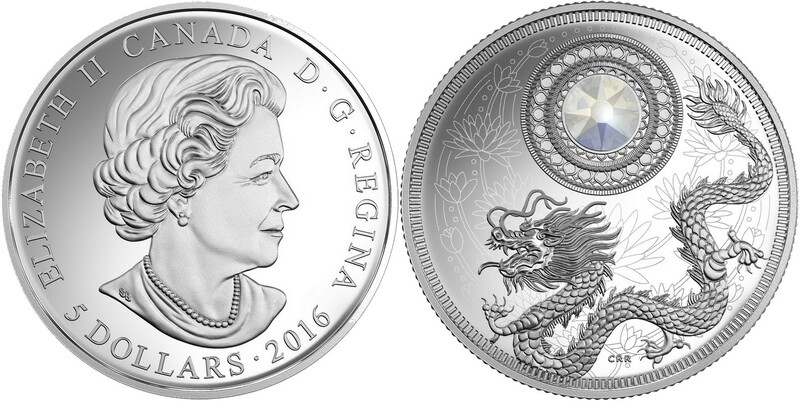 CANADA 5 Dollars 2016 – Birthstone – June – 7.96 g 0.999 silver Proof (with one Swarovski crystal) – mintage 3,000 – diameter 27 mm – price $40. 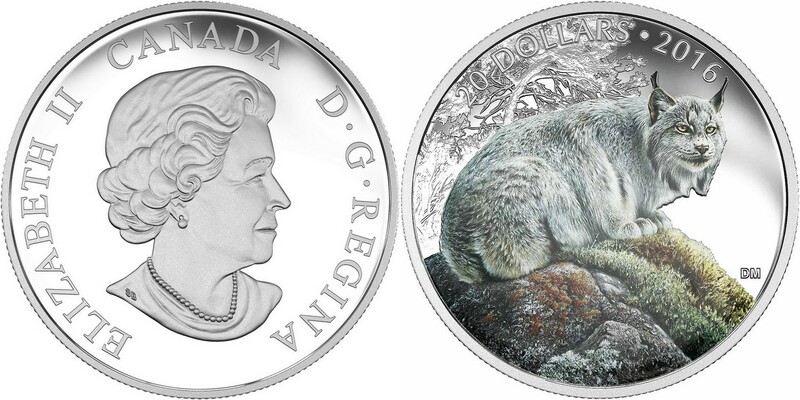 CANADA 10 Dollars 2016 – Reflets de la faune – Loutre – 15,87 g Argent 999 Proof – 15 000 exemplaires – diamètre 34 mm – prix 28 euros. 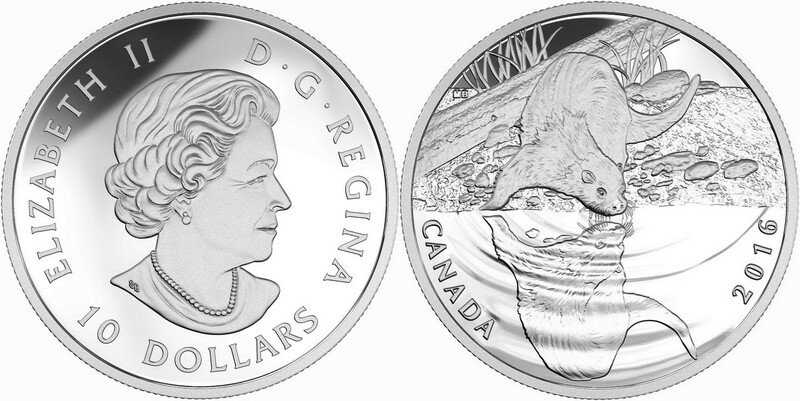 CANADA 10 Dollars 2016 – Reflections of Wildlife – Otter – 15.87 g 0.999 silver Proof – mintage 15,000 – diameter 34 mm – price $32. CANADA 20 Dollars 2016 – Avions de la première guerre mondiale – Sopwith Triplane – 31,83 g Argent 999 Proof – 7500 exemplaires – diamètre 40 mm – prix 69 euros. CANADA 20 Dollars 2016 – Aircrafts of the First World War – The Sopwith Triplane – 31.83 g 0.999 silver Proof – mintage 7,500 – diameter 40 mm – price $79. 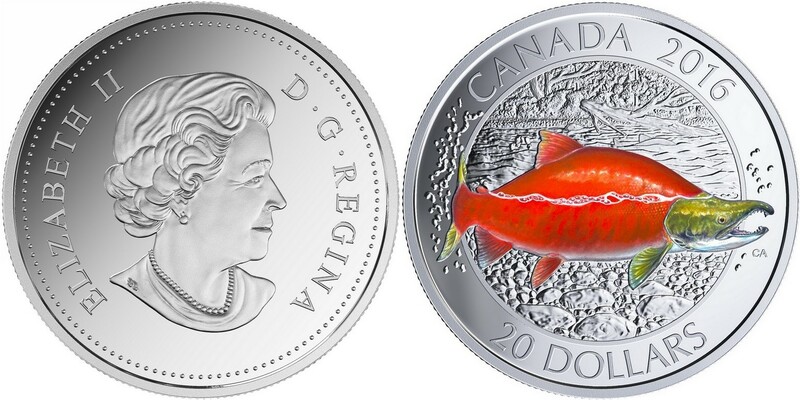 CANADA 20 Dollars 2016 – Grands poissons canadiens : Saumon rouge – 31,83 g Argent 999 Proof – 5500 exemplaires – diamètre 40 mm – prix 69 euros. CANADA 20 Dollars 2016 – Canadian Salmonids : Sockeye Salmon – 31.83 g 0.999 silver Proof – mintage 5,500 – diameter 40 mm – price $79. 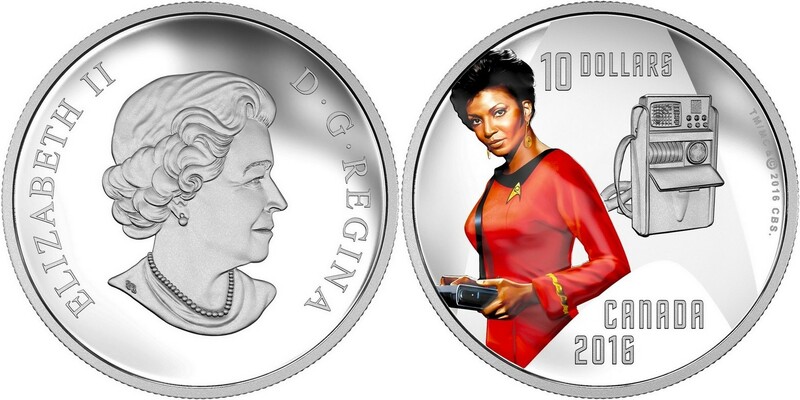 CANADA 50 Dollars 2016 – Automne somptueux – 157,6 g Argent 999 Proof (avec du verre Murano) –2000 exemplaires – diamètre 65,25 mm – prix 379 euros. 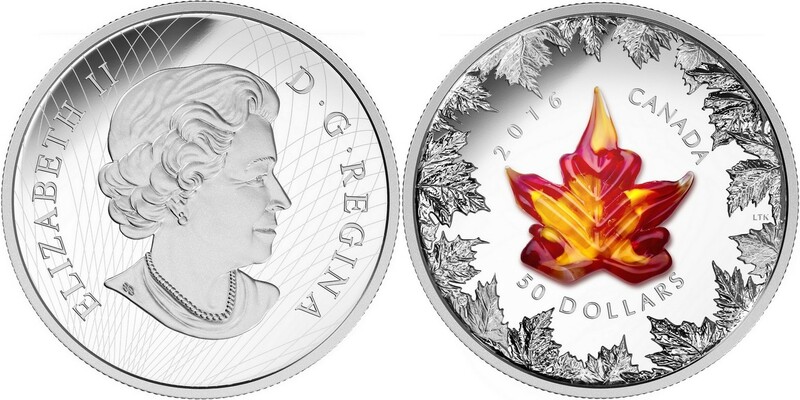 CANADA 50 Dollars 2016 – Autumn Radiance – 157.6 g 0.999 silver Proof (with Murano Glass) – mintage 2,000 – diameter 65.25 mm – price $437. CANADA 20 Dollars 2016 – Petits du monde animal : Le plongeon huard – 31,39 g Argent 999 Proof – 5500 exemplaires – diamètre 38 mm – prix 69 euros. 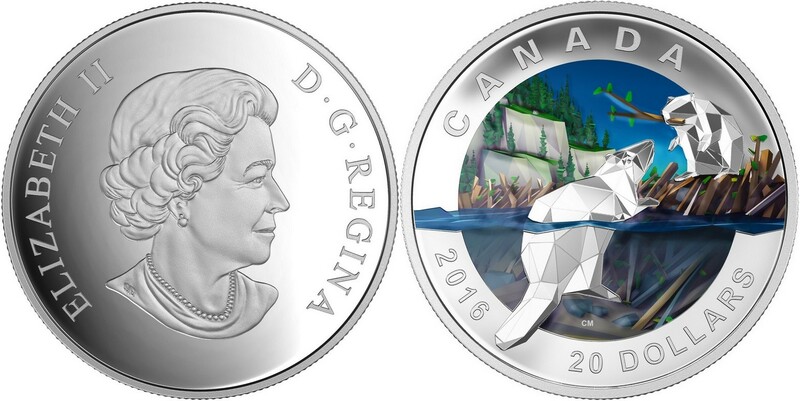 CANADA 20 Dollars 2016 – Baby animals : Common Loon – 31.39 g 0.999 silver Proof – mintage 5,500 – diameter 38 mm – price $79. CANADA 15 Dollars 2016 – Héros nationaux : Pompiers – 23,17 g Argent 999 Proof – 10 000 exemplaires – diamètre 36,07 mm – prix 48 euros. 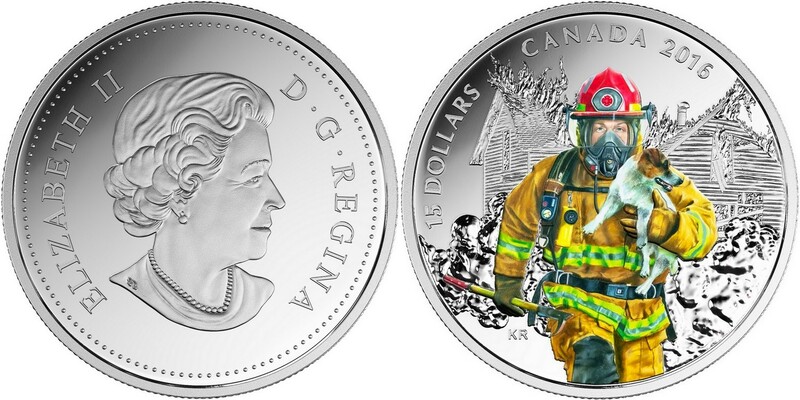 CANADA 15 Dollars 2016 – National Heroes : Firefighters – 23.17 g 0.999 silver Proof- mintage 10,000 – diameter 36.07 mm – price $56. 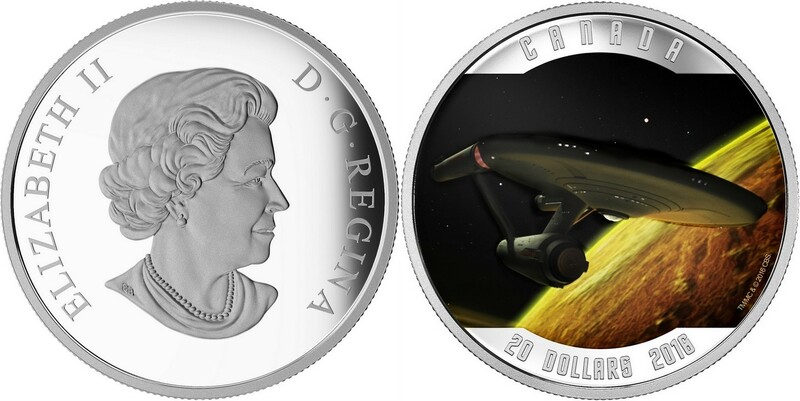 CANADA 20 Dollars 2016 – Univers : ondes radio – 31,39 g Argent 999 Proof (monnaie photoluminescente) – 8500 exemplaires – diamètre 38 mm – prix 103 euros. 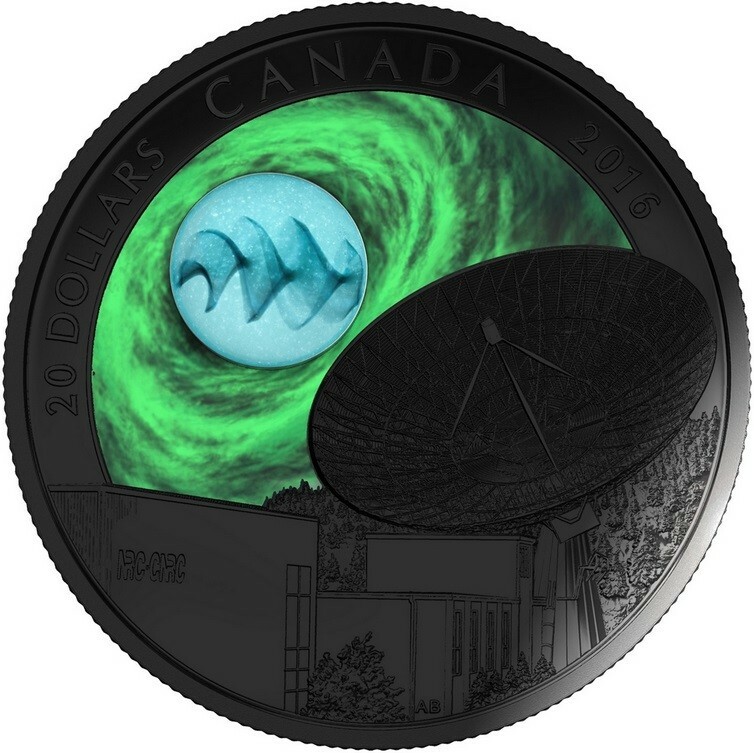 CANADA 20 Dollars 2016 – Universe : Radio Wave – 31.39 g 0.999 silver Proof (photoluminescent coin) – mintage 8,500 – diameter 38 mm – price $119. CANADA 10 Dollars 2016 – Jour des dinosaures : dinosaure cuirassé – 15,87 g Argent 999 Proof – 10 000 exemplaires – diamètre 34 mm – prix 31 euros. 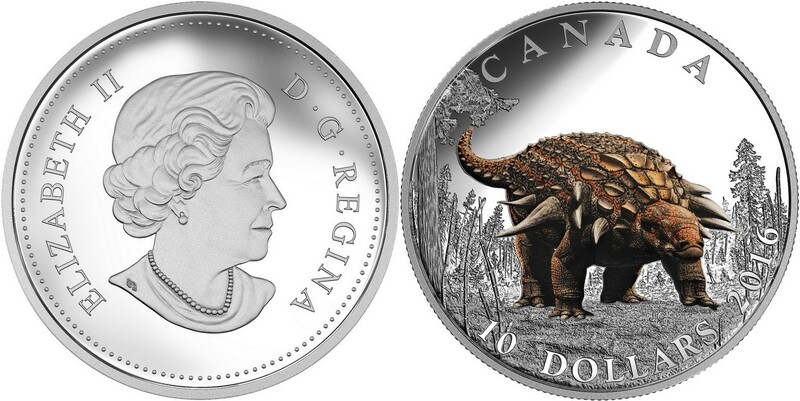 CANADA 10 Dollars 2016 – Day of the Dinosaurs : Armoured Tank – 15.87 g 0.999 silver Proof – mintage 10,000 – diameter 34 mm – price $36. 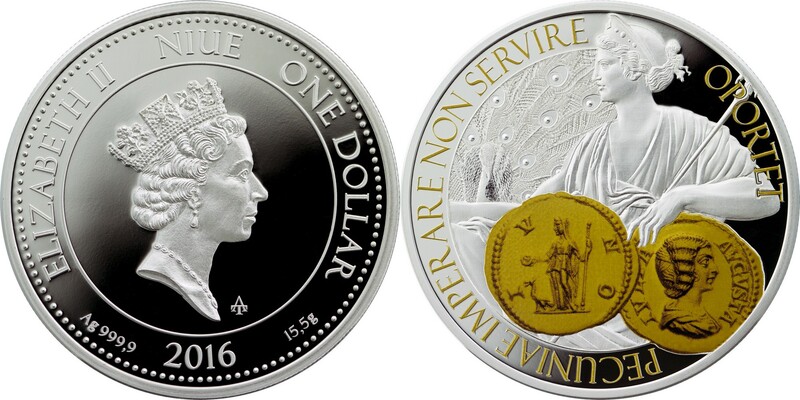 NIUE 1 Dollar 2015 – Ours brun – 31,1 g Argent 999 Proof – 750 exemplaires – diamètre 38,61 mm – prix ignoré. 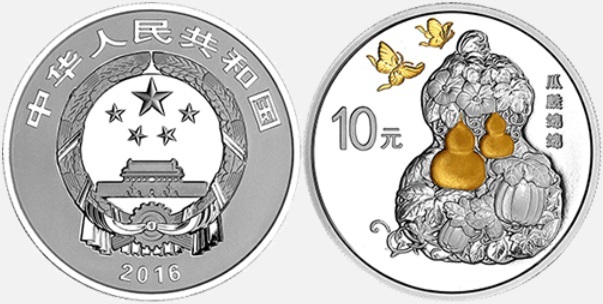 NIUE 1 Dollar 2015 – Brown Bear – 1 oz 0.999 silver Proof – mintage 750 pcs – diameter 38.61 mm – unknown price. CONGO 10000 Francs CFA 2016 – Yeux de la nature – Léopard oriental – 1 kg Argent 999 finition antique (avec l’œil en résine) – 99 exemplaires seulement – diamètre 100 mm – prix ignoré. 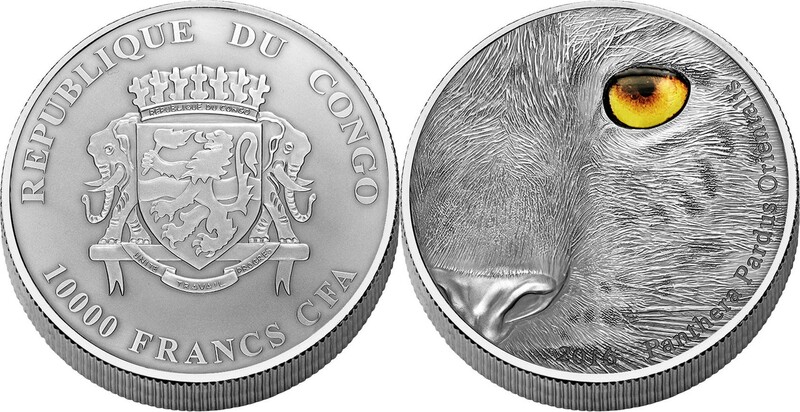 CONGO 10000 Francs CFA 2016 – Nature’s Eyes – Amur Leopard – 1 kg 0.999 silver antique finish (with resin eye) – mintage 99 pcs only – diameter 100 mm – unknown price. 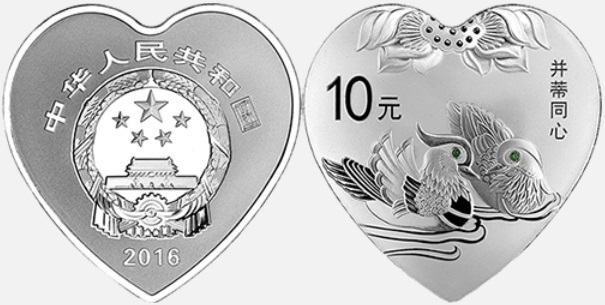 CHINE 4 x 10 Yuan 2016 – Bon augure – 4 x 30 g Argent 999 Proof – 60 000 exemplaires – diamètre 40 mm – prix environ 100 euros chaque sauf le coeur plus cher. 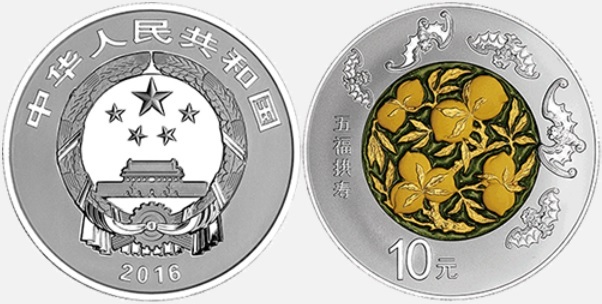 CHINA 4 x 10 Yuan 2016 – Auspicious culture – 4 x 30 g 0.999 silver Proof – mintage 60,000 – diameter 40 mm – approx. price $115 each except the Heart more expensive. MALTE 10 Euro 2016 – 450 ans de la fondation de La Valette – 28,28 g Argent 925 Proof – 2500 exemplaires – diamètre 38,61 mm – prix 60 euros. MALTA 10 Euro 2016 – 450th anniversary of the foundation of Valetta – 28.28 g 0.925 silver Proof – mintage 2,500 – diameter 38.61 mm – price $68. FIDJI 2 x 1 Dollar 2016 – Iron man et Captain America – 2 x 31,1 g Argent 999 Proof – 3000 exemplaires – diamètre 50,7 mm – prix observé 149 euros. FIJI 2 x 1 Dollar 2016 – Iron Man & Captain America – 2 x 1 oz 0.999 silver Proof – mintage 3,000 – diameter 50.7 mm – observed price $169. FIDJI 1 Dollar 2016 – Veuve noire – 31,1 g Argent 999 Proof – 3000 exemplaires – diamètre 40,7 mm – prix observé 70 euros. FIJI 1 Dollar 2016 – Black Widow – 1 oz 0.999 silver Proof – mintage 3,000 – diameter 40.7 mm – observed price $79. FIDJI 1 Dollar 2016 – Panthère noire – 31,1 g Argent 999 Proof – 3000 exemplaires – diamètre 40,7 mm – prix observé 70 euros. FIJI 1 Dollar 2016 – Black Panther – 1 oz 0.999 silver Proof – mintage 3,000 – diameter 40.7 mm – observed price $79. FIDJI 1 Dollar 2016 – Soldat d’hiver – 31,1 g Argent 999 Proof – 3000 exemplaires – diamètre 40,7 mm – prix observé 70 euros. FIJI 1 Dollar 2016 – Winter Soldier – 1 oz 0.999 silver Proof – mintage 3,000 – diameter 40.7 mm – observed price $79. 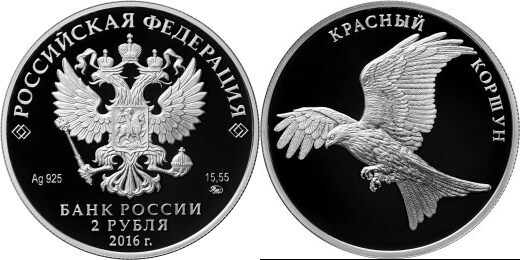 FIDJI 1 Dollar 2016 – Faucon – 31,1 g Argent 999 Proof – 3000 exemplaires – diamètre 40,7 mm – prix observé 70 euros. 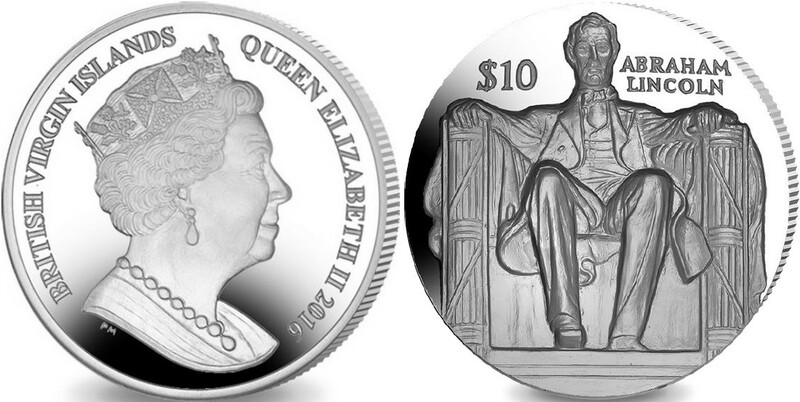 FIJI 1 Dollar 2016 – Falcon – 1 oz 0.999 silver Proof – mintage 3,000 – diameter 40.7 mm – observed price $79. 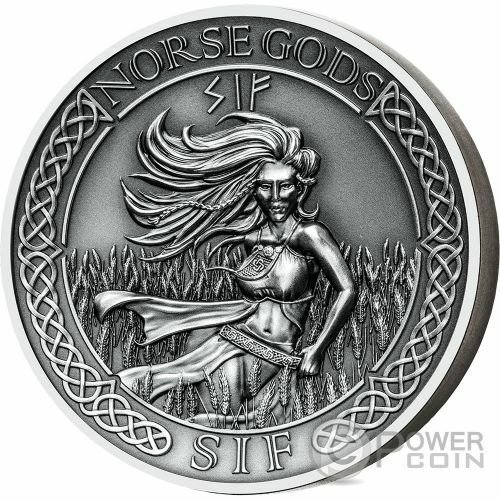 ILES COOK 10 Dollars 2016 – Dieux Nordiques – Frigg – 62,2 g Argent 999 finition antique (haut relief) – 1000 exemplaires – diamètre 38,6 mm – prix environ 100 euros. 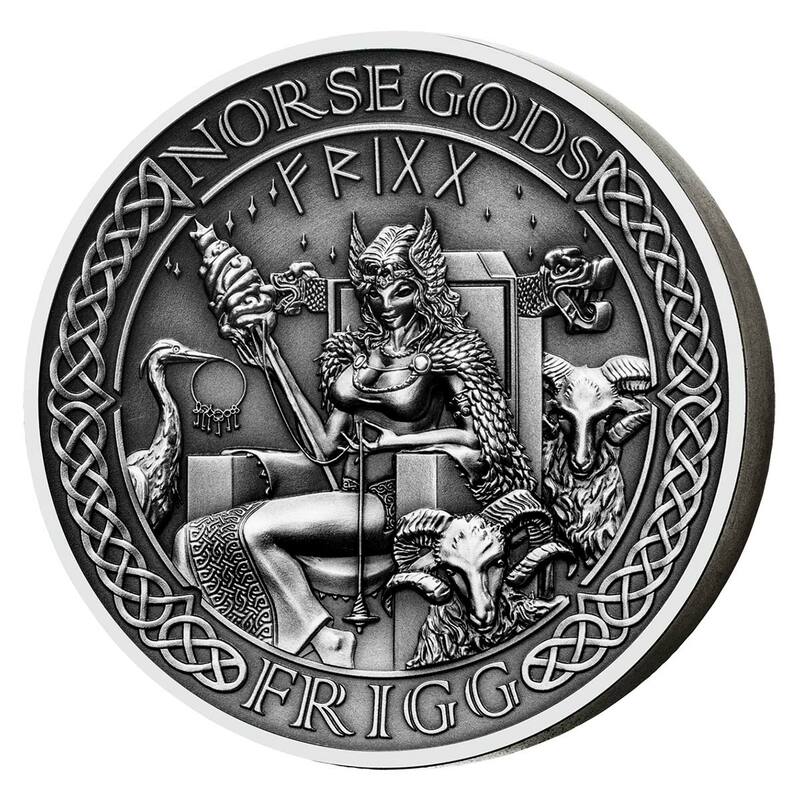 COOK ISL 10 Dollars 2016 – Nordic Gods – Frigg – 2 oz 0.999 silver antique finish (high relief) – mintage 1,000 – diameter 38.6 mm – approx. price $113. 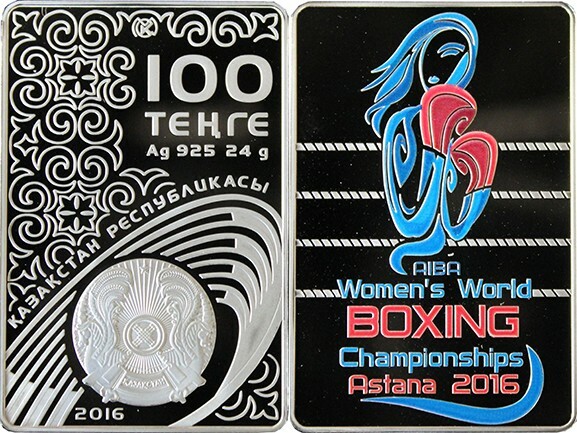 KAZAKHSTAN 100 Tenge 2016 – Championnats du monde de boxe feminine – 24 g Argent 925 Proof – 1000 exemplaires – taille 30 x 45 mm – prix ignoré. KAZAKHSTAN 100 Tenge 2016 – Women’s World Boxing Championships – 24 g 0.925 silver Proof – mintage 1,000 – size 30 x 45 mm – unknown price. 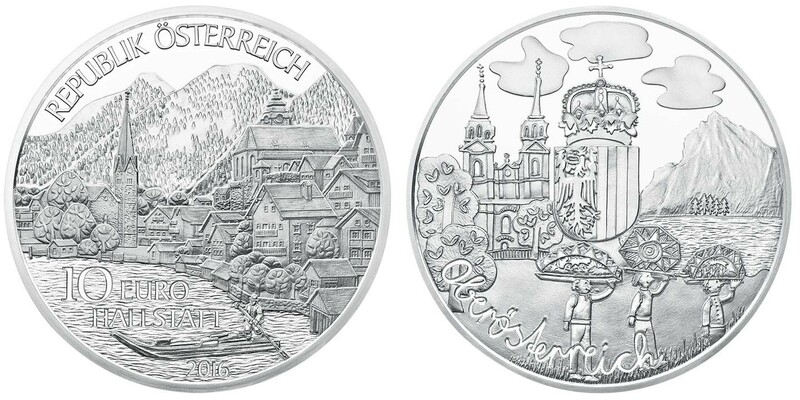 LETTONIE 5 Euro 2016 – Manteau du Hérisson – 28,28 g Argent 925 Proof – 10 000 exemplaires- taille 42 x 35 mm – prix 50 euros. 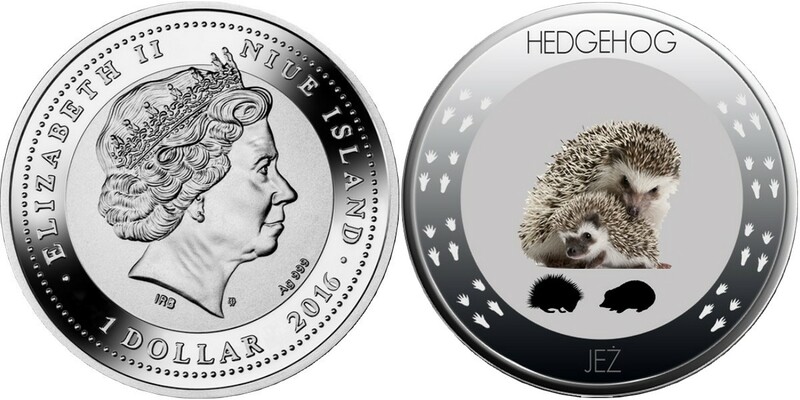 LATVIA 5 Euro 2016 – Hedgehog’s coat – 28.28 g 0.925 silver Proof – mintage 10,000 – size 42 x 35 mm – price $57. 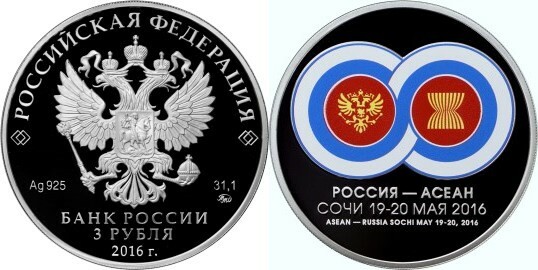 MONGOLIE 1000 Togrog 2016 – Ogodei Khaan – 25 g Argent 925 Proof – 2500 exemplaires – diamètre 38,61 mm – prix ignoré. 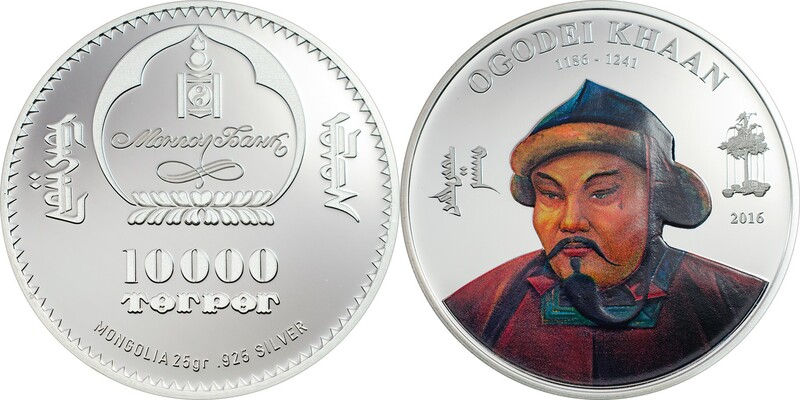 MONGOLIA 1000 Togrog 2016 – Ogodei Khaan – 25 g 0.925 silver Proof – mintage 2,500 – diameter 38.61 mm – unknown price. CANADA 20 Dollars 2016 – 40ème saison des Toronto Blue Jays – 31,39 g Argent 999 Proof – 40 000 exemplaires – diamètre 38 mm – prix 70 euros. CANADA 20 Dollars 2016 – 40th season of the Toronto Blue Jays – 31.39 g 0.999 silver Proof – mintage 40,000 – diameter 38 mm – price $80. 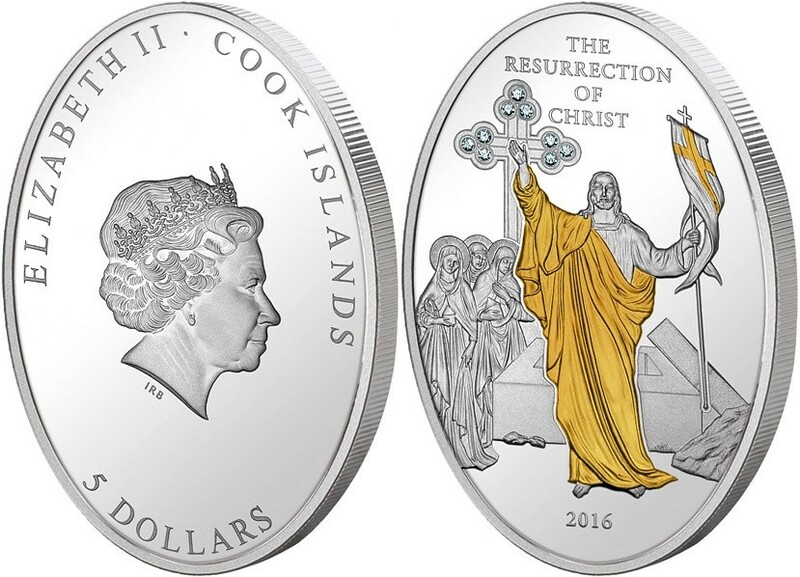 ILES COOK 5 Dollars 2016 – Résurrection du Christ – 25 g Argent 999 Proof (partiellement plaqué or avec 9 cristaux Swarovski) – 5000 exemplaires – taille et prix ignorés. COOK ISL 5 Dollars 2016 – The Resurrection of Christ – 25 g 0.999 silver Proof (partially gold plated with 9 Swarovski crystals) – mintage 5,000 – size and price unknown. 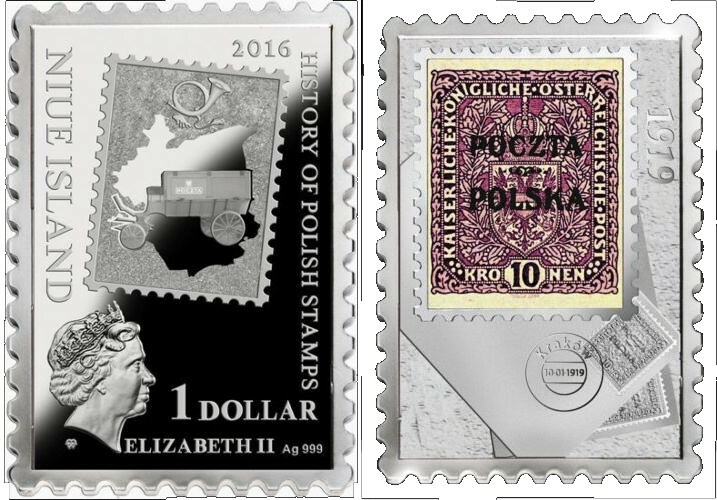 ILES COOK 10 Dollars 2016 – Monuments de Berlin – 35,1 g Argent 999 Proof (monuments plaqué or en 3D) – 2000 exemplaires – diamètre 38,61 mm – prix ignoré. 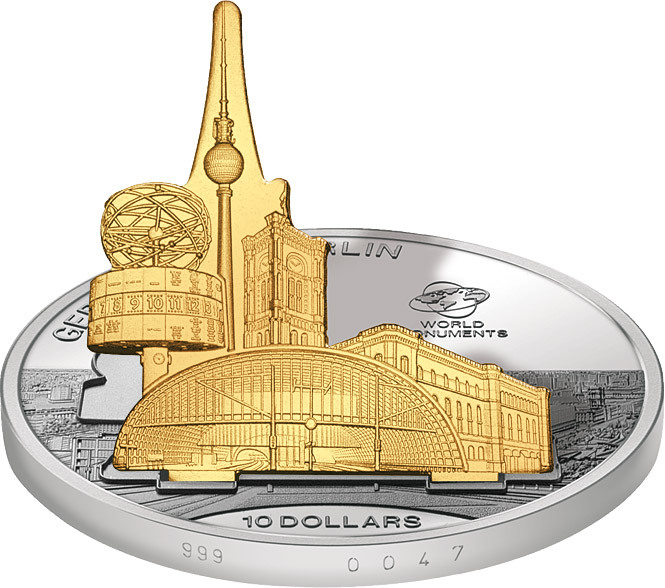 COOK ISL 10 Dollars 2016 – Berlin Monuments – 35.1 g 0.999 silver Proof (gilded 3D monuments) – mintage 2,000 – diameter 38.61 mm – unknown price. ITALIE 10 Euro 2016 – Enzo Ferrari – 22 g Argent 925 Proof – 8000 exemplaires – diamètre 34 mm – prix 60 euros. ITALY 10 Euro 2016 – Enzo Ferrari – 22 g 0.925 silver Proof – mintage 8,000 – diameter 34 mm – price $69. TUVALU 50 Cents 2016 – Bébés Jaguars – 15,59 g Argent 999 Proof – 5000 exemplaires – diamètre 32,6 mm – prix 39 euros. 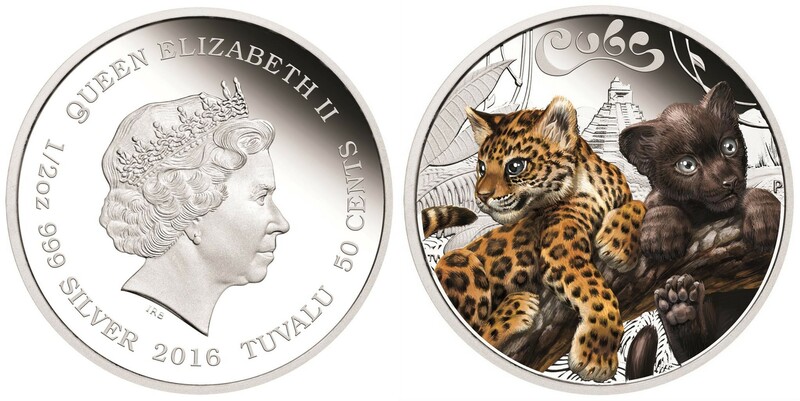 TUVALU 50 Cents 2016 – Cubs – Jaguar -15.59 g 0.999 silver Proof – mintage 5,000 – diameter 32.6 mm – price $45. TUVALU 1 Dollar 2016 – Iguane – 31,13 g Argent 999 Proof – 5000 exemplaires- diamètre 40,6 mm – prix 60 euros. 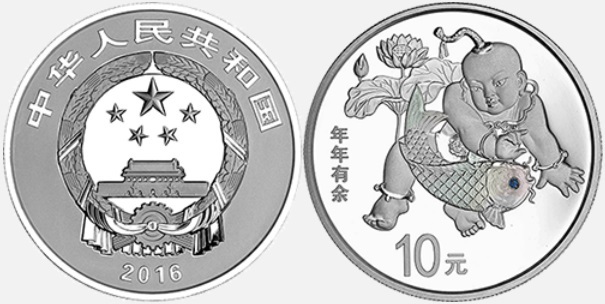 TUVALU 1 Dollar 2016 – Goanna – 31.13 g 0.999 silver Proof – mintage 5,000 – diameter 40.6 mm – price $69. TUVALU 2 Dollars 2016 – Langage de l’amour – 62,27 g Argent 999 Proof – 3000 exemplaires – diamètre 50,6 mm – prix 108 euros. 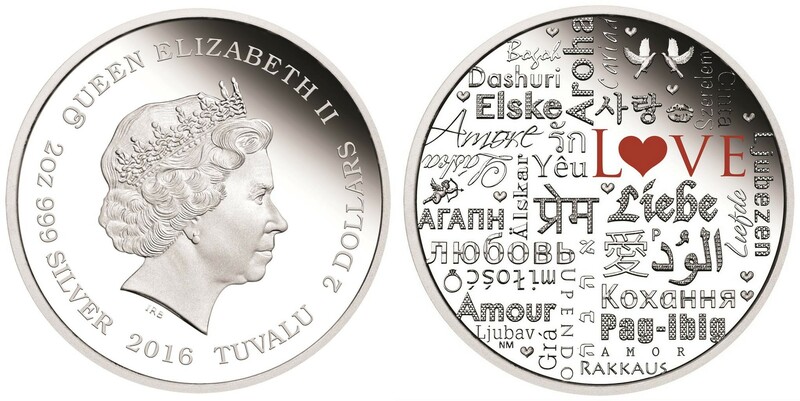 TUVALU 2 Dollars 2016 – Language of Love – 62.27 g 0.999 silver Proof – mintage 3,000 – diameter 50.6 mm – price $124. AUSTRALIE 1 Dollar 2016 – Kookaburra – 31,13 g Argent 999 Proof (haut relief) – 10 000 exemplaires – diamètre 32,6 mm – prix 66 euros. 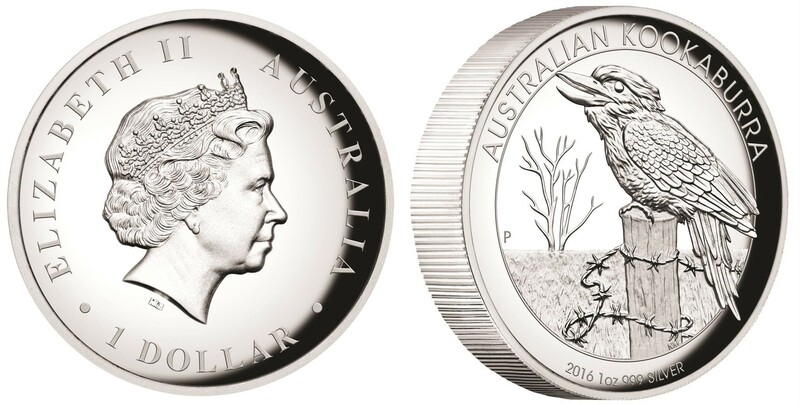 AUSTRALIA 1 Dollar 2016 – Kookaburra – 31,13 g 0.999 silver Proof (high relief) – mintage 10,000 – diameter 32.6 mm – price $76. AUSTRALIE 8 Dollars 2016 – Kookaburra – 155,67 g Argent 999 Proof (haut relief) – 1000 exemplaires – diamètre 50,6 mm – prix 292 euros. AUSTRALIA 8 Dollars 2016 – Kookaburra – 155.67 g 0.999 silver Proof (high relief) – mintage 1,000 – diameter 50.6 mm – price $336. AUSTRALIE 30 Dollars 2016 – Koala – 1 Kg Argent 999 Proof – 500 exemplaires seulement – diamètre – 100,6 mm – prix 1054 euros. 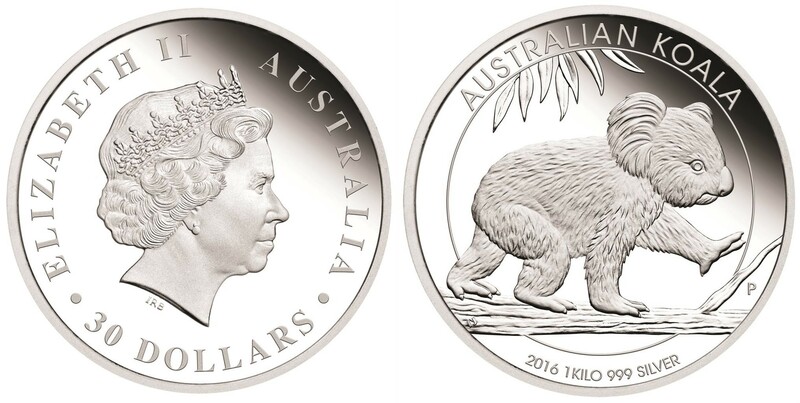 AUSTRALIA 30 Dollars 2016 – Koala – 1 Kg 0.999 silver Proof – mintage 500 pcs only – diameter 100.6 mm – price $1,213.